The magical Harry Potter series now available as eBooks you can read on your PlayBook! If you love Harry Potter and all things Hogwarts, you're going to be really happy to learn that the books are now available in eBook format. No more lugging those heavy books around when you need your wizardry fix; fire up your favorite eReader app and read to your heart's content. Sounds great, and it is, however there are a few catches. First, the Harry Potter series eBooks are only available through The Pottermore Shop, so you'll have to buy them there and then send them to your eReader. Not a huge deal, as they've covered their bases with the formats and pretty much anything you need is available. The second catch however is a bit more annoying as a BlackBerry PlayBook owner, and I'm just going to come out and say it. 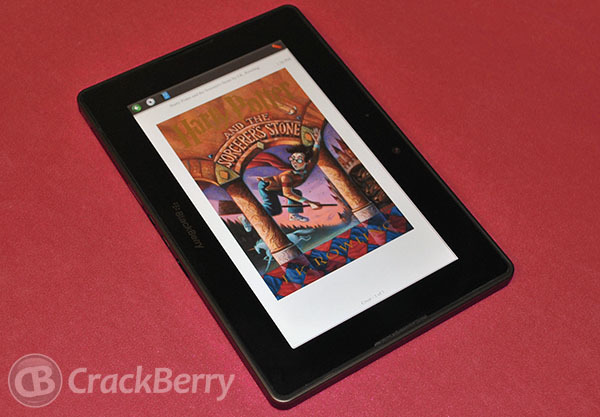 The Kobo app for BlackBerry and the BlackBerry PlayBook is pretty crippled, and as such you won't be able to read the Harry Potter books you purchase in the Kobo app. Fortunately, there are alternatives to Kobo on the PlayBook, such as Book Reader (available for $.99 in App World) or side-loading the Kindle app. I had no trouble at all importing the .epub file into Book Reader and in seconds was reading away. The 7 books can be purchased individually for $7.99-9.99, or as a set for $57.54. It looks like the website is only allowing purchases in the US and UK at this time, which will hopefully be expanded in the future. Each book you purchase can be downloaded 8 times from the site, so all of your devices can feel some Harry Potter love.